Drivers with large families, or those who simply need a large amount of portable storage space, should look no further than the 2018 Volkswagen Atlas. How much storage space comes with the 2018 Volkswagen Atlas? This three-row crossover SUV should have more than enough cabin and cargo space to hold luggage for family travels or to transport larger items. Let’s break down the details. Read More: How Much Does the Redesigned 2019 Volkswagen Jetta Cost? The 2018 Volkswagen Atlas is available in five different trim levels. While these models differ in power and performance due to the availability of two engine options, the interior dimensions of every 2018 Atlas model remains consistent. Your choice in trim level will not impact the amount of storage available. Drivers and passengers alike should be able to ride in comfort with the 2018 Atlas’ cabin space. Front-row seats have a generous 41.3 inches of headroom and 41.5 inches of legroom. Second-row and third-row passengers are given 40.4 inches of headroom space and 37.6 inches of legroom. Three adults can easily fit into the third row without sacrificing too much personal space. With a crossover SUV this spacious, your passengers are sure to have more than enough room. The 2018 Volkswagen Atlas’ cargo space should be more than satisfactory as well. With all seats put in place, the 2018 Atlas has a cargo space of 20.6 cubic feet. With all rows folded, that measurement skyrockets to a total of 96.8 cubic feet of cargo space. A variety of small-item storage spaces are available as well. This is more than enough space to easily travel with the entire family’s travel gear without the ride feeling cramped and cluttered. Looking to purchase the 2018 Volkswagen Atlas? View our online inventory and browse for your new vehicle today. What is the Driving Range for the 2018 Volkswagen Atlas? 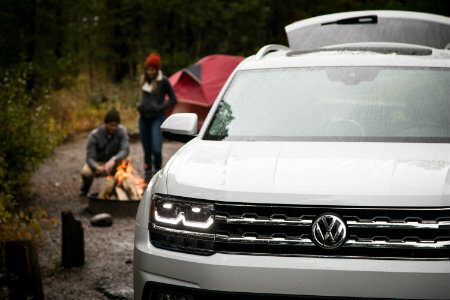 This entry was posted on Monday, July 2nd, 2018 at 7:40 pm	and is filed under Volkswagen Atlas. You can follow any responses to this entry through the RSS 2.0 feed. You can skip to the end and leave a response. Pinging is currently not allowed.